I was fortunate enough to win a trip to Puerto Vallarta, Mexico (I still can't believe it). This is a review of our trip. Although I received the trip free of charge, the opinions in this review are my own. There is so much to cover, my review will comprise a series of posts. I'm from the East coast, and most of the people I know around here tend to vacation in other areas of Mexico, particularly the Eastern side of Mexico. So I thought this was a unique opportunity to experience an area that not many people I know have been to and share my experience with them. We flew out of the Saint John Airport (New Brunswick, Canada) in the early morning and had a quick turnaround time in Montreal. Next thing we knew we were on a nearly 6 hour flight (!) to Puerto Vallarta, Mexico. This would be our first trip to Mexico. 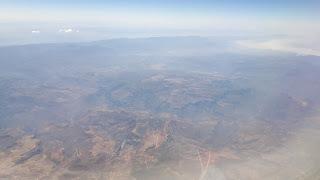 As we approached Puerto Vallarta, we started to see some mountains in the terrain below. Our view from the plane as we approached Puerto Vallarta, Mexico.